Mrs Pope’s reminiscences of the 1920s in Manor Road, published as Local History Notes 2, aroused considerable interest. In this, her second set of recollections, she gives “a sort of biographical account of life as a child going to school, describing the surrounding buildings and the people who lived in them.” Her account is complemented by delightful pen-and-ink sketches of the properties mentioned in the text. buildings and the people who lived in them. was or how little you got for it, it was money. out to work and one got married. in everything that went on around me, making memories more impressionable. (no teasmade or plugging in the electric kettle!). I cannot remember what we had for breakfast. there was not a lot of milk, and we mostly had tinned milk. (we had from 12 noon till 2 o’clock then) and that we did in all weathers. got plenty of smells that were not exactly aromatic. which made it a place of mystery for us, wanting to see what was on the other side of the wall. taken to a party there. for granted then, but look upon it as a ‘masterpiece’ now. do to put out one’s washing now, things have a habit of disappearing. a cousin who was a greenkeeper, and some would go caddying for a few shillings. for Typke and King, the chemical factory. (‘Donne Place’ is there now). ‘Suntrap houses’ are). There was a fence at the bottom of the garden of one of these bigger houses. the fence. I reckon that’s where those you find growing on the Common came from originally. My brother reckons they used to go scrumping there. something to do with the houses that were built around here later. believe there is just one left in one of the front gardens along there now. adjoining one. Mr Dalton was a County Councillor and JP and was respected by most. the Common opposite was a pond called Pinnocks Pond, with a great poplar tree beside it. which could have been used for horse and carriage. trees have gone now, and no doubt the water is piped underground. even a farthing, and a quarter pound of custard cream biscuits. Helen and Mary. I believe the two daughters still live in the cottages along there. and then down the lane to the cottages. of a struggle, so I still cannot play the piano. seemed to have. It was an old firm and it was sad to see it go. There was always a row of shops from the corner which is now a Chinese along to Lloyd’s Bank. Preedy’s, the card shop, was Craig’s tobacconists and leather goods and bridles and horse gear. Ruff I believe, sitting in the window repairing the shoes. years, and then a Bingo Hall. It was rebuilt for Sainsbury’s and is now Quik-Save (what next?). much money, but they were clean. we danced around the Maypole, plaiting the coloured ribbons, and then reversing to unwind them. called Miss Carpenter. By this time I was about nine, and could read, write, do sums, knit and sew. I even came top of the class with another girl. We had a lovely headmistress called Miss Hunt. of children going on the Common, its difficult to tell the teachers from the children. there, and I did well. I left to go out to work, to get all of 8 shillings a week. our own folks instead of being shut away from them. to have been born then although times were lean. It was a safer place to live in than it is today. that was rare and only in the summer. children of today, but it was part of life. a matter of course. I still feel, with all the modern wonders, it was a nicer place than it is today. 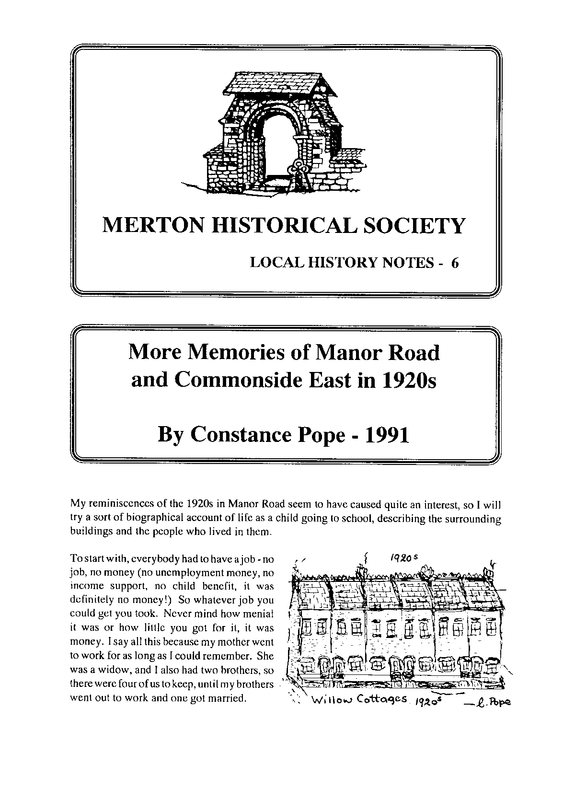 This entry was posted in Publications, Local History Notes and tagged in lhn, mitcham, Reminiscences, urban mitcham.